This wonderful Mas, made with local materials, is perfectly insulated and seems to be part of the surrounding natural environment. This oasis of peace and quiet is a source of wellbeing and energy. Nature lovers will be delighted, but you can also find something to your hearts desire by visiting the towns of Nîmes, Uzès and Avignon for a day. Sports lovers have plenty to discover: hiking and mountainbiking routes, lovely canoe trips and, less than 3 km away, the Gardon with crystal clear water, beaches and waterfalls. It is a beautiful spot for young and old. 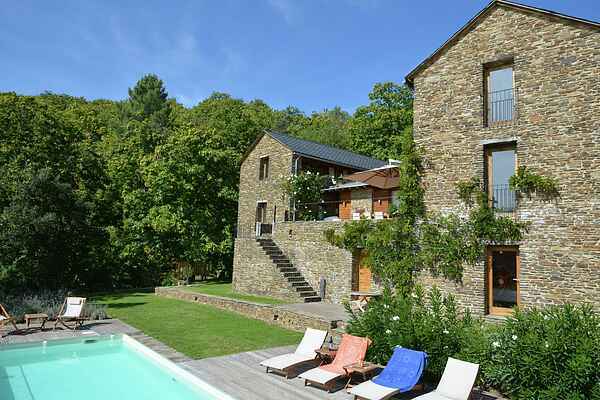 La Bastide is situated in the centre of the Cévennes and offers a breathtaking view of the south. Take a walk in the one hectare garden, sit under a chestnut tree, enjoy The swimming pool is exceptionally attractive, heated and equipped with an electric roll cover. A staircase takes you to the central terrace with an unprecedented view. The terrace is surrounded by the Bastide and opens into nature, with a view of the pool and the mountains. An original pizza oven, large dining set and reclining chairs; you can enjoy yourself here until the wee hours. There is easy access to the kitchen that is an important aspect of the Bastide as a central area. The roof is planted with lovely flowers and plants. There are two wings with several floors from the kitchen. A large dining room and couch, fireplaces, leisure room with flat screen television, game room with table tennis and four bedrooms and four bathrooms. This exceeds a holiday; it's a genuine experience.